House, 4 Bedrooms, 3 Baths, sleeps 8. 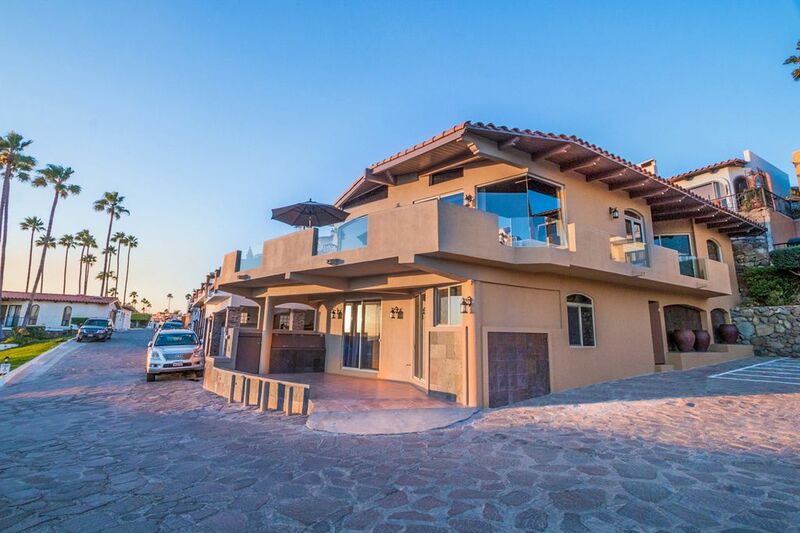 Reminiscent of a small Mediterranean village, LAS GAVIOTAS is a beautiful private ocean front gated community of cobblestone streets on one of the most picturesque stretches of coastline in all of Baja California. Come and see for your self, the minute you enter through the gate the beauty of this wonderful community will capture your heart for ever!. The home is perfect for a romantic, family or any other get-away vacation that is only 30 minutes south of the border. The year round moderate climate allows the perfect get-away for any season. WHY IS THIS HOME YOUR BEST VALUE? Simply because in comparison to LOCATION, VIEWS, SIZE, CLEANLINESS, AGE and CONDITION, this home will offer you the most for your money, guaranteed! FYI, the home had some recent interior and exterior upgrades including new paint. The stove, refrigerator, dishwasher, microwave even the toaster, coffee maker and blender where just replaced. Brand new patio set and BBQ too. More details below. Unlike many rentals in the community that are located back to back to the loud highway, have no ocean or poor ocean views or have views only from the roof top of the home and or are a long distance away from the community amenities and the ocean, this beautiful home is conveniently located right across the passage way that takes you straight to the ocean water, sandy beach, surfing spot, beach volleyball and the beautiful board walk where you may take your morning and evening walks and so much more!. This beautiful home is also located on the SE, the nicer side of Las Gaviotas community. Farther more, this home is not built in between homes, it is built on a WONDERFUL corner location that allows for PANORAMIC 180 degree ocean views to beautifully flow in to the home. The patio is larger than most, it is perfect for sunbathing, for reading your favorite book while listening to the sound of the waves, for viewing some of the most beautiful sunsets, for watching people surfing, for viewing the marine life as they go passing by, great for barbecues and for enjoying a cold beer or ice Margarita and so much more! WORLD CLASS SURFING AT YOUR FINGERTIPS! Do you like to surf? Remember, the surfing spot to this community is conveniently located immediately right across from this home, only about 1 minute walk straight to the beach. Las Gaviotas is considered one of the best surf breaks In Northern Baja & Southern California. The peak breaks both right and left. You will never find our beach to be over crowded since it is a private beach. Enjoy the view of the waves while enjoying your morning coffee on your private patio, then grab your board and be surfing in seconds! GOLF IN BAJA AT IT'S FINEST! Located within 20 minutes are two world class Golf Courses-Bajamar & Real Del Mar, I will gladly provide you with more information upon your request. Enjoy your game with the most stunning views of the Blue Pacific waters while you are surrounded by the most beautiful greeneries!. Come and tour the beautiful Valle de Guadalupe wine country located about 30 minutes from Las Gaviotas. Within the proximity you will also find an Amusement Park that includes many types of entertainment from swimming pools to boat paddling, picnicking and a zoo. "PUERTO NUEVO'' THE OLD FAMOUS LOBSTER VILLAGE! Located about a mile away. After a beautiful day, you may want to consider dinning at any one of the many restaurants this famous village has to offer. Not only you will find great lobster but also the best fresh salsa, guacamole, hand made flour and corn tortillas and so much more!. If you prefer Italian, American Steak house, Sushi, Chinese, or French no problem I will gladly provide you with a list of these many wonderful places too. A NIGHT OF FUN AT THE CITY! Do you feel like dancing? Put on your dancing shoes and hit any one of the many clubs the city has to offer. My favorite is ''PAPAS & BEER'' is about 6 miles from the community and located right on the sandy beach. This club is fairly large, bright and airy it offers sand VOLLEYBALL as well as other entertainment and food. DO YOU FEEL LIKE JUST RELAXING IN THE SUN? No problem, feel free to bring your preferred sports gear equipment. Las Gaviotas offers great surfing, parasailing, an Olympic size pool, over sized Jacuzzi, beach combing, beach Volleyball, Shuffleboard, Tennis, Miniature Golf and Children's Park all on site. HOW TO BOOK THIS BEAUTIFUL HOME! Your booking should be very easy but if you encounter any technical issues please let me know ASAP also feel free to contact vrbo. Note, in off season single nights can be accommodated with the exclusion of weekends but you must contact me to discuss. Before sending your request confirm your DATES and RATES, click on the BOOK NOW button follow the instructions and you will be on your way to paradise!!! PLEASE NOTE: Las Gaviotas community has rules and regulations that are here for your own safety and enjoyment. In this picture my husband and our son after a fun day of surfing on our community private beach. We are proud parents of 2. We have owned property in Las Gaviotas Community for over 25 years. This is where my husband and I plan to retire. We are happy to share our beautiful home with our friends and family and gladly to extend the same opportunity to your family and friends. Be assured that I will do my best to help your stay be as comfortable and memorable as possible. :) Thank you for your consideration and for renting our home. The reputation of this wonderful community is unlike no other. 'Las Gaviotas' is the best known ocean front private Community around!. Come and see for your self, once you visit this wonderful community you will not want to leave, it will capture your heart for ever!. THE NEWEST & CLEANEST HOME WITH STUNNING VIEWS OF THE BLUE PACIFIC OCEAN!!! BEST LOCATION!!! THE CLOSEST HOME TO THE SANDY BEACH YOU WILL FIND AT THIS RATE! The path that takes you down to the sandy beach is located right across from the home and only steps from the water. I have owned property here for over 25 years, in comparison to all rentals, this home will offer you the most for your money, guaranteed!. Rosarito Beach City offers a lot of window shopping, great restaurants and night clubs just to mention a few. THIS HOME HAS SPECTACULAR BEACH VIEWS!!! 2 WORLD CLASS GOLF COURSES ONLY MINUTES AWAY! Some mountains views and city lights at night. THE HOME HAS STUNNING OCEAN VIEWS!!! THIS ELITE COMMUNITY IS SITUATED ON BEACH FRONT LAND. The phone is offered to call the homeowner and or security in case of an emergency. Also, to call the homeowner if there is anything you need. I wanted to let you know that the air conditioning is currently not working and that there are plenty fans through out the home. Also, the home usually gets a wonderful ocean breeze. All beds have linens but you are welcome to bring extra. MUST USE (he) DETERGENT ONLY. Laundry room offered only to reservations of 3 nights or more. Please feel free to contact me in advance with any questions. Laundry room offered to reservations of 3 nights or more. Please feel free to contact me in advance with any questions. Please note the fire place is for wood, at this time due to the rug placed near to it and the safety concerns no wood burning allowed inside the home. Please use the portable heaters. Thank you. Yes, per HOA community rules only 2 cars per home are allowed. Any additional will be at the guest responsibility. Yes, bath towels provided. But you must bring your BEACH TOWELS. Thank you. Please note, per HOA community rules the fitness room is not allowed to be used by renters but there are MANY on site activities. Feel free to contact me with any questions. Brand new sectional and flat screen TV in the living room. New refrigerator. Please, keep all sea food in tight sealed containers to prevent any spills and or smell. Thank you. Very nice and airy with a nice size breakfast bar area and large formal dining. Brand new stove, microwave, refrigerator, coffee maker etc,. Very nice size dining area with additional breakfast counter with 4 barstool seatings. Right in front of the home and throughout the beautiful community. The community is guarded 24/7, feel free to bring your personal sport gear and enjoy. Huge deck (larger than most other homes) with beautiful PANORAMIC ocean views!!! Please don't forget to bring your own. Also, feel to ask me for information on local rental shops. Located on site. Must bring your equipment. Make sure to check the schedule with security. Miniature Golf and Children's park on site only steps away from the home. And 2 huge locations within minutes from the community. Feel free to bring your equipment. The home is accessible from the first floor through a down stairs bedroom slider with one step that is conveniently located right in front of the home. Please see main picture of the home. Note a full bath is also available in this area. Feel free to contact me with any questions. Olympic size pool, luke warm most of the time and located right on the beach surrounded by stunning views of the blue Pacific ocean! We shared the house with another family over spring break and had a fantastic time. The house is spacious and tastefully decorated. The balcony is perfect for enjoying the sun, checking the surf, and bbqing the nightly dinner. With young kids, the location of the house was perfect. It is a short walk to the beach and swimming pool. There was a problem with the water heater, but once we let Scott & Marisella know, they had several technicians out until the problem was fixed. Overall, we would highly recommend this as a place to stay and enjoy Las Gaviotas. We had a wonderful time staying in your home! Beautiful views, well equipped kitchen, close to the water, great surf... Thank you so much for opening up your home to us! Highly recommend for another stay in Gaviotas. Best Home in the Community! Great home in a great location. Very helpful and attentive homeowner. We had an amazing time! Thank you we had a wonderful time, the house is very large and for both of our families comforatably. Gorgeous views and large balcony patio. Thank you! lovely stay over thanksgiving weekend at marisella's house with our family. the home is very clean, stocked with amenities, gorgeous views and location. great value. thanks! What a nice and updated home in Las Gaviotas. Once you walk into the home you are overwhelmed by how welcoming and beautiful it is. The pictures don't show the true house, its better in person. It's gorgeous and clean. The views from the balcony were to die for. You are one row back from the ocean but it didn't matter as there is a short walkway directly from her house to the beach. I highly recommend this rental, I have stayed in others oceanfront but this one was a beauty and had plenty of entertaining space. Marisella, the owner was a great communicator from beginning to end. Highly recommend! FUN, FUN & MORE FUN!!! Additional to 'Las Gaviotas' Community Amenities of the Tennis Court, Olympic size Swimming pool & large jacuzzi, Beach Volleyball, Shuffleboard, Children's Miniture Golf & Swings park, Surfing, Parasailing, This Beautiful Home is within distance of 2 magnificent golf courses!! !, Beautiful Wineries & wine tasting tours, First class Spas, Arts & Galleries, Ocean front RV Camping, ATV'S, Restaurants, Dancing night Clubs, Deep Sea fishing and of course the World's famous lobster Village Restaurants of ''Puerto Nuevo'' & so much more!! !